This Italian gourmet jelly is made with real Merlot Wine and during the cooking process the alcohol evaporates and the flavor and aroma of the Merlot remains. 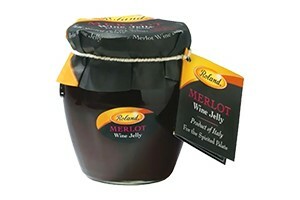 Try this wine jelly with creamy brie, your favorite Cheddar, on a croissant or with some chicken and beef. Why is it so liquid? It's jelly and supposed to slip and slide inside the jar. Once you dip into the jar you will see that it really is solid and the jelly keeps its shape. Use a spoon to scoop the jelly out of the jar and refrigerate (after opening), just like any other jelly. Ingredients:Merlot wine, sugar, lemon juice, natural apple pectin.